So, after reading The Count of Monte Cristo I felt bereft. No book I picked up called to me whatsoever so I decided to pick up A Room of One’s Own because if all else fails, Virginia Woolf, right? It was a good choice and, honestly, I wish I had started my love affair with Virginia here. I had actually started this previously, I had almost finished it too, as I was reading this on the bus for several days but I chose to pick it up and read it properly and that was a much better decision. Woolf is an author who needs a lot of attention to pick up the nuances of her work and it is hard to put any of her books down; at least in my experience! 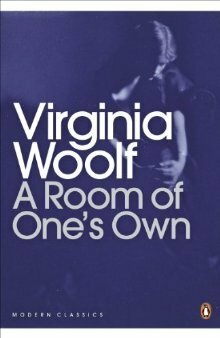 A Room of One’s Own is a non-fiction text, it’s a slim 112 pages and is based on a series of lectures that Virginia delivered in Cambridge. It is pegged as a feminist classic and I have to agree with that term. While it’s a classic and is 86 years old, so much of it still felt relevant today. She covers female writers in history, Jane Austen, the Bronte sisters, George Eliot and also, Shakespeare’s fictional sister. She tells us how it is only with a fixed income (500 pounds a year) for independence and ‘a room of one’s own’ that a woman will be free to create whatever they please. She makes sure that as a reader we know how brief and limited their histories are. It seems she wrote this to be enduring as she encourages the reader to to acknowledge how their female ancestors fought for just five minutes peace and a few pieces of paper to pen their thoughts. Trying to put my thoughts in to words for this book is, again, difficult. I just don’t know how because she has left me with so many thoughts and feelings I don’t even know how to put in to words. Virginia Woolf is just one of the finest writers that has ever lived. This only emboldens that statement, for me. If you haven’t read any Woolf, I would really suggest starting here because it is so readable – it is much easier than Orlando to get through! I ultimately think I give this 4/5 but it is one I know I will revisit and KNOW I will possibly love more on doing that. Ah, reading this reminds me I need to finish reading Woolf – I have read about half of her books, but this particular one sits in the as-yet-unread pile (not for any particular reason that I know of, mind you). It sounds really interesting so I’m sort of surprised I haven’t read this one already. My love affair with Woolf has only started recently but I’ve got through half of her bibliography in just a few short months. This is one that wasn’t that high on my TBR and as you said, there was no reason for that! It was a very interesting read and honestly, if I had read it earlier – at school even – I would have loved Woolf a whole lot sooner! This was my first Virginia Woolf! It was a wonderful introduction. I need to re-read it when I have some time to really devote myself completely to it (because, yes, Woolf needs your undivided attention. Totally agree).